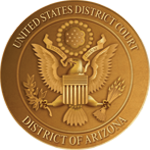 At this location, you may file documents, obtain court records and attend court hearings. Clerk's Office: 8:30 a.m. - 4:30 p.m. Courthouse: 8:00 a.m. - 5:30 p.m.
No public parking available at the courthouse. There is limited street parking (meters) available near the courthouse. Private parking lots and garages are available for hourly/daily rates within walking distance of the courthouse. Juror parking, which is validated by the Court, is available at the city/state employee parking garage, located at 498 W. Congress Street. To access the garage, enter from the alley between the Circle K store and the west side of the parking structure. Parking is also available at the Rio Viejo Lot at 419 W. Congress Street (entrance is approximately 400 feet west of the courthouse). Bring your ticket with you for validation. Juror parking is also available at the Tucson Convention Center on Granada south of Congress. Jurors will be required to pay a nominal charge up front and then be reimbursed. Please let the jury office know if you park here so that we can provide you with the reimbursement form.